To build Trump's border wall, the federal government would have to seize private property—more than it already has. The border between the United States and Mexico is the busiest land border in the world and one of the longest, covering more than 1,950 miles from the Pacific Ocean to the Gulf of Mexico. Four U.S. States (California, Arizona, New Mexico, Texas) and six Mexican ones (Baja California, Sonora, Chihuahua, Coahuila, Nuevo León, Tamaulipas) have territory along it. The Rio Grande, which flows to the Gulf of Mexico, accounts for some 1,240 of those miles, while the land boundary cuts through terrain running the gamut from desert to mountains. As of 2014, 653 miles of this border has been fenced at a cost of about $7 billion. A few dozen miles are reinforced with secondary and tertiary fencing. About half of the fencing is designed to prevent pedestrians from crossing through, while the other half just blocks vehicles. The U.S. Department of Homeland Security reports that the pedestrian fencing cost an average of $6.5 million per mile, and the vehicle fencing $1.7 million per mile. Border wall construction slowed to a halt in recent years, due in no small part to a slew of obstacles to its construction. But border-wall chatter is spiking during the 2016 U.S. presidential race, with Republican nominee Donald Trump’s proposal to build a full wall along the southern border serving as a cornerstone of his candidacy. AS/COA Online takes a look at what’s been built so far and what stands in the way of future construction. Three events in the mid-nineteenth century established the modern U.S.-Mexico border: the United States’ annexation of Texas in 1845; Mexican cession of California and most of Arizona and New Mexico territory at the end of the Mexican-American war in 1848; and the 1853 Gadsden Purchase, which pushed the Arizona and New Mexico borders further south to their present location. The 1848 Treaty of Guadalupe also established the Rio Grande as an official international border. U.S.-Mexico diplomatic relations frayed and tensions rose during the Mexican Revolution (1910–1920) and World War I (1914–1918), leading both sides to restrict cross-border migration and send soldiers to put up some of the first border fences. One of the first times the U.S. government erected a permanent barrier on the border had to do with environmental concerns rather than human migration. The National Park Service put up cattle fencing along the Arizona-Sonora border in an effort to keep Mexican cattle from wandering in and overgrazing in the Organ Pipe Cactus National Monument, as well as infecting U.S. livestock with diseases. Today’s border barrier first took shape during the George H.W. Bush administration, when the United States built a 66-mile wall beginning at the border’s western end in the Pacific Ocean and extending inland. Known by the U.S. Border Patrol as the San Diego sector, this sector is one of the smallest but busiest border sections, including the San Ysidro border point. The Congressional Research Service says the primary fence alone did not make a “discernible” deterrence in the flow of unauthorized migrants across the border, causing the government to step up border personnel. During President Bill Clinton’s time in office, he authorized a 14-mile extension to the San Diego sector wall as part of the Immigration Reform and Immigrant Responsibility Act. Some landowners in Arizona, New Mexico, and Texas built walls on their properties, but the government did not erect permanent barriers in those states at that time. With over 100 miles of border fence built in 2006, George W. Bush signed the Secure Fence Act, which called for 670 miles of new fencing. Part of the fence was to go through the San Pedro Riparian National Conservation Area in eastern Arizona. For that to happen, then-Homeland Security Secretary Michael Chertoff waived 19 environmental regulations—including the Endangered Species and Clean Water Acts—in the parklands, plus another 17 for the project as a whole. Two conservation groups, Sierra Club and Defenders of Wildlife, sued the government over these exemptions. Although a federal judge temporarily halted the wall’s construction in 2007, the Supreme Court ultimately declined to hear the environmentalists’ suit in 2008. 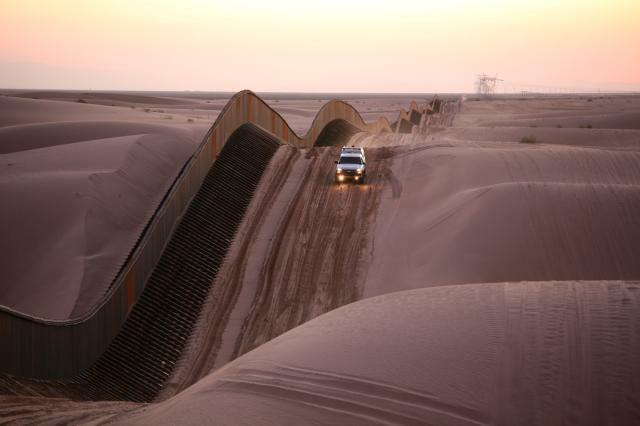 From 2006 to 2009, the government put up about 450 new miles of border fence. The costs of Trump’s proposed wall aside, its construction would face numerous logistical challenges. 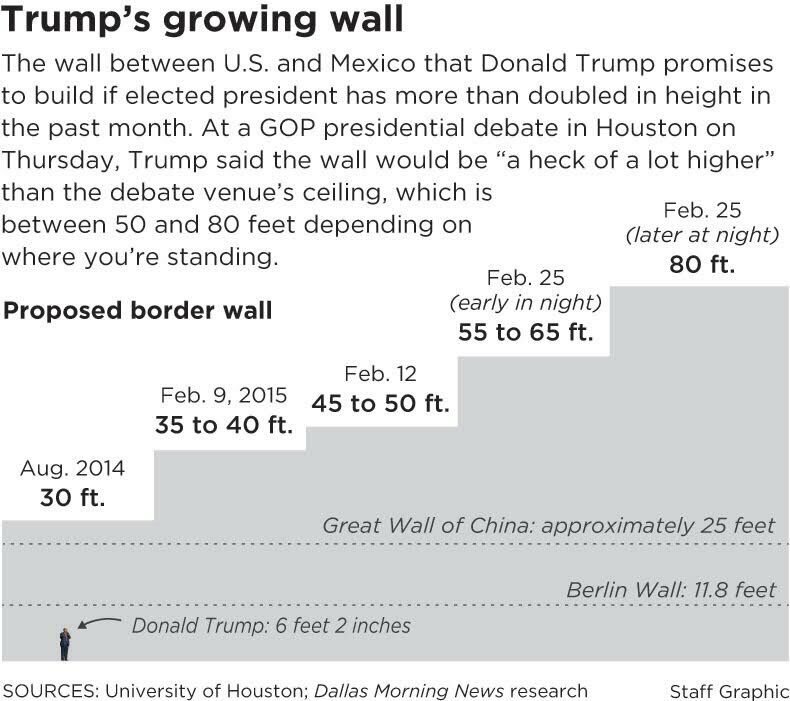 While the height of Trump’s wall has fluctuated (usually upward) over time, he intends for it to be a tall, non-porous pedestrian wall made of concrete, rebar, and steel. Once the border wall reaches Texas, the floodplains of the Rio Grande present an immense logistical hurdle. The river traces the border between Texas and Mexico, and its floodplains extend onto either side of the border. Flooding from the Rio Grande is not an uncommon occurrence, particularly when hurricanes hit, and border fences that exist in the region have exacerbated flooding by acting as a dam where water is meant to flow freely. Per a 1970 boundary treaty signed by the United States and Mexico, both countries are prohibited from building any structure that would disrupt the flow of either the Rio Grande or the Colorado River, which draws a small section of the border between Arizona and Baja California. Some 66 percent of land along the U.S.-Mexico border is either private- or state-owned; the rest is owned by the federal government or Native tribes. While the federal government has succeeded in using eminent domain to seize private and state property for the construction of border fences in the past, citizens and local governments have put up tremendous resistance, causing significant delays and creating a “costly logistical nightmare.” Trump’s proposed wall could impact thousands more homeowners, particularly ranchers of Texas who rely on access to the Rio Grande and wide pastures for their livestock. In addition to the acres of private property, around 75 miles of the U.S.-Mexico border in Arizona is part of the Tohono O’odham Indian reservation. The third-largest reservation by area in the United States, the original Tohono O’odham territory was bifurcated by the Gadsden Purchase. Some O’odham found themselves in the United States, and another portion in Mexico. Tribe members still live on both sides of the border and like to freely cross between the two as they consider the entirety of the territory their ancestral lands. Border constructions have a detrimental effect on the many valuable wildlife reserves and diverse ecosystems found along the U.S.-Mexico border. Animals such as gray wolves, jaguars, and bison rely on hunting on lands that extend onto both sides of the border. Existing border barriers regularly cut animals off from their water sources and migration corridors. The species most at risk are those with small populations and highly specific habitats, including endangered animals such as the Arroyo toad and California red-legged frog, both endemic to regions of southern California and Baja. Environmental threats also carry economic threats. The Rio Grande Valley of Texas is one of the most biodiverse regions in all of North America, and tourism is a major part of the economy for communities on both sides of the border; wildlife watchers spend some $463 million in the valley annually. Border barriers already affect as much as 70 percent of the valley’s three national wildlife refuges, reducing the range size for some animals by as much as 75 percent. According to a 2014 report, the construction of security barriers along the border have a negative impact on animal species living on protected areas.